Pprintable Halloween movie gift coupon, good for free movie tickets. 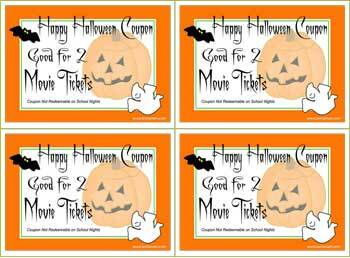 Print and personalize - click on the small Halloween coupon sheet picture below to print a sheet of 4 Halloween gift coupons good for 2 free movie tickets - you supply the actual theatre tickets! These Halloween gift coupons are good for all ages, but especially nice for older children and teens. Tuck a set of coupons into a small envelope, staple several together into a booklet or use a single trick or treat coupon as a Halloween gift tag. Halloween Gift Cell Phone Minutes is another popular printable coupon. Click to view details and print a sheet of 4.